As I promised you in the last post, I've layered Hottie with 2 awesome polishes that I got from Ange from Scandalously Polished (thanks again :D). I used Pure Ice Heart Breaker and CND Sapphire Sparkle from their effects-series. 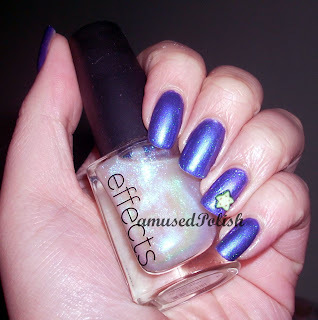 Sapphire Sparkle was only layered over my ringfinger and I added a little fimo star fruit to give it a little twist :) The swatches show two coats each of the layering polish. Somehow my camera is a bit overhelmed by the magnificance of this polish-combo that it didn't show the duo/quadro-chrome effect of my ring finger (from the "Scrangie blue to a magenta to the Hottie purple).